Day 14 of WDW-40, the latest of my Disney Trip Reports, is here! 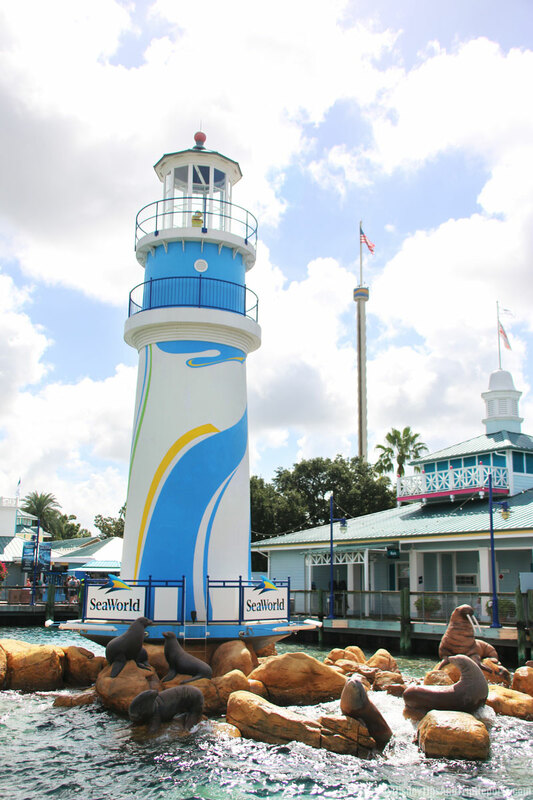 Today we spent a day at SeaWorld Orlando, where we watched One Ocean, Blue Horizons, and Pets Ahoy. Dinner in the evening was at one of our favourite offsite restaurants – Bahama Breeze. 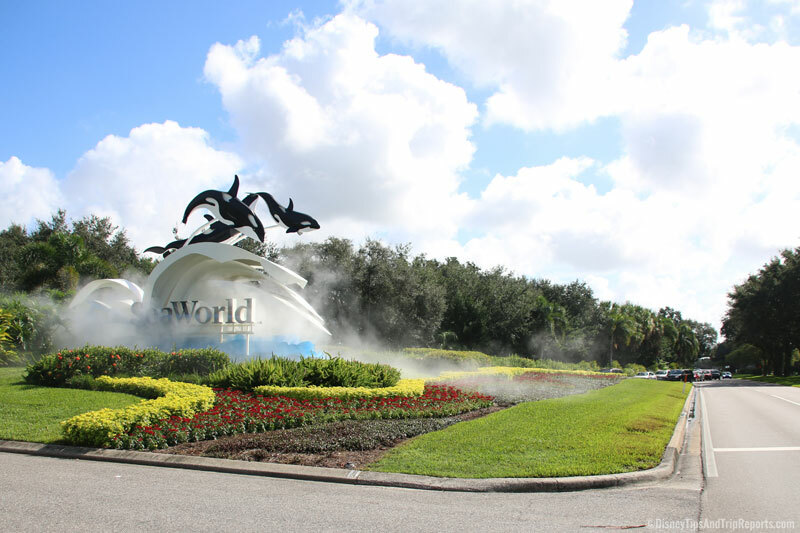 We have visited SeaWorld twice on previous holidays to Orlando – in 2011, and 2013; so it’s a few years since we’ve been. Now of course, there is a lot of controversy with this park, but it is not something I will enter into on my blog. 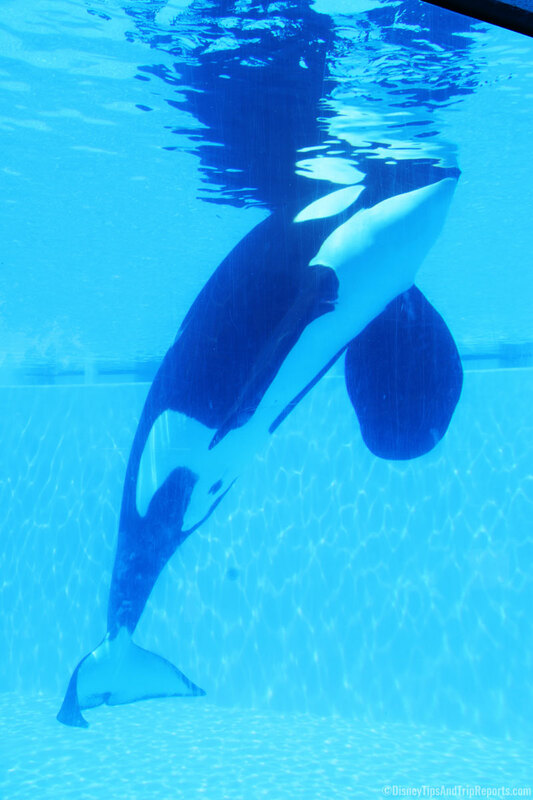 Do I feel sad/sorry for the orca, dolphins and other sea creatures that have to live in a confined tank rather than the wide open oceans? Yes, I do. 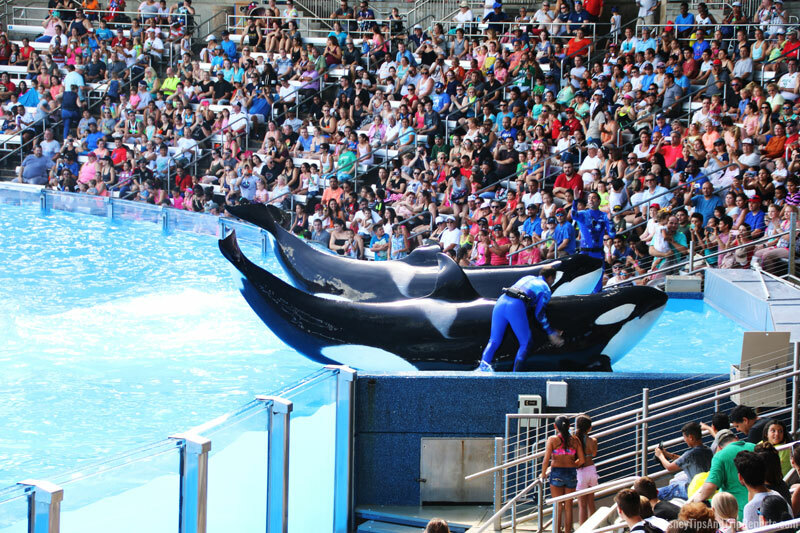 But I also feel that SeaWorld does a lot of good for conservation too. 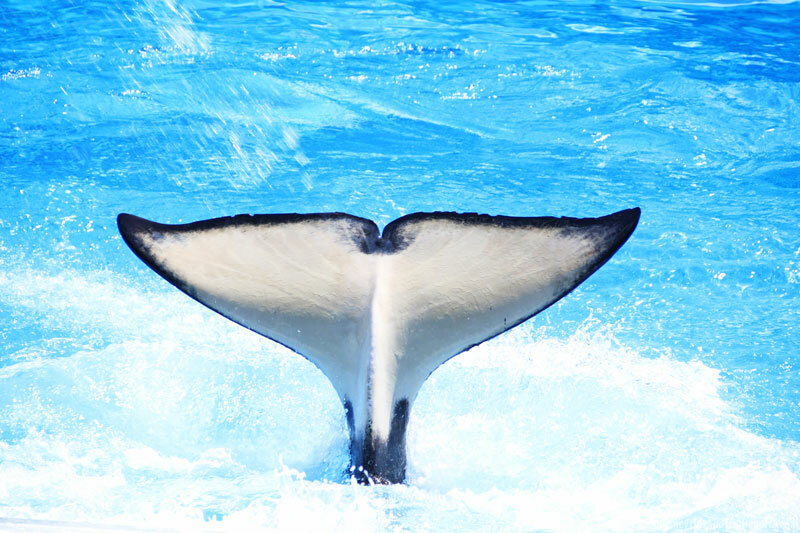 You can read more about their projects on SeaWorld Cares. 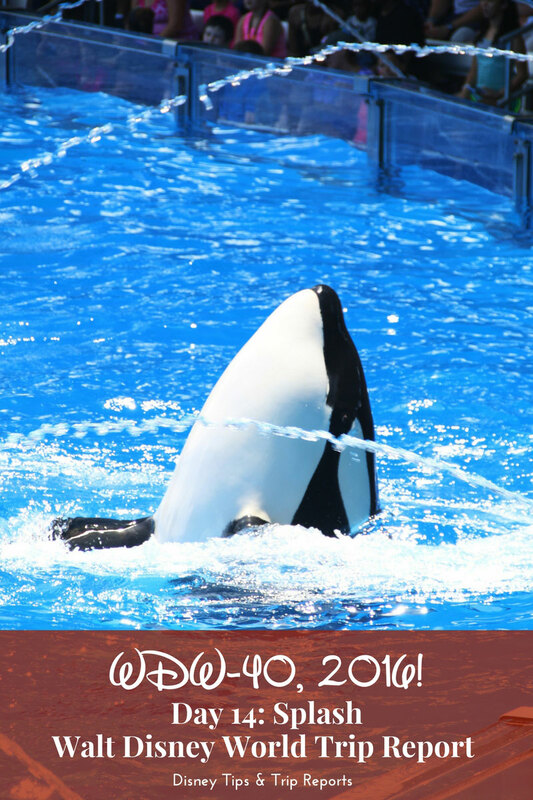 If you do not support SeaWorld, and are not comfortable reading today’s report, then please do pass on today’s trip report. 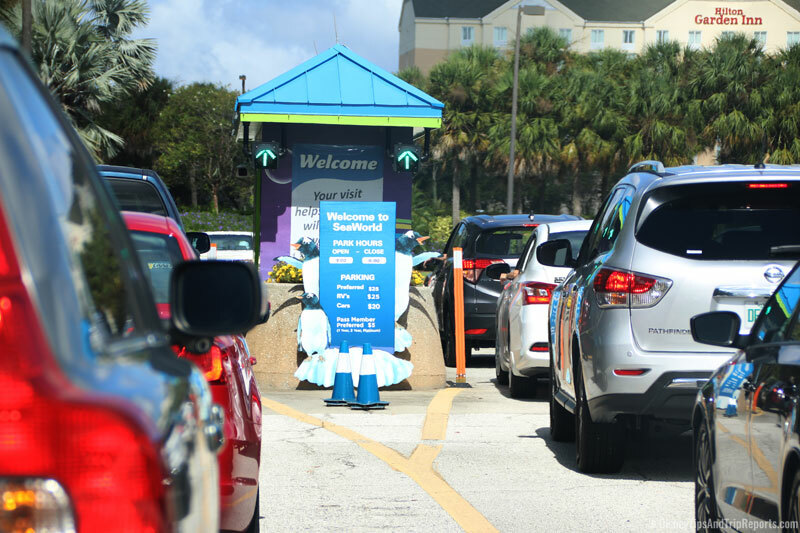 We had a bit of a late start this morning, so didn’t arrive at SeaWorld until around 10:30, where we were met with a huge queue of cars. I don’t think we’ve ever had to line up for theme park entry in our car, ever. It took a good 30+ minutes to get to the parking booth, where we paid $25 for preferred parking. It basically means you get to park closer to the park’s entrance. Once parked we were faced with even more chaos trying to get into the park. There was no order whatsoever to go through security, just one huddled mass of people converging. Unlike Disney Parks where there is a separate line for those on ECVs, there was nothing like that here. When you are seated well below people’s eye level, you get pushed in front of, even though you are politely waiting to get through. Then add in groups of people, young children, parents with single and double pushchairs – pandemonium is probably the way to describe the situation. It took us another 30+ minutes to get through security. Considering how smoothly things had run so far for us at Disney, (as well as in the future, Universal) this was a big shock to the system. I am hoping this was an exception, rather than the norm. Once inside the park, we grabbed a map, and Meg’s only request that day was to see the killer whale show. 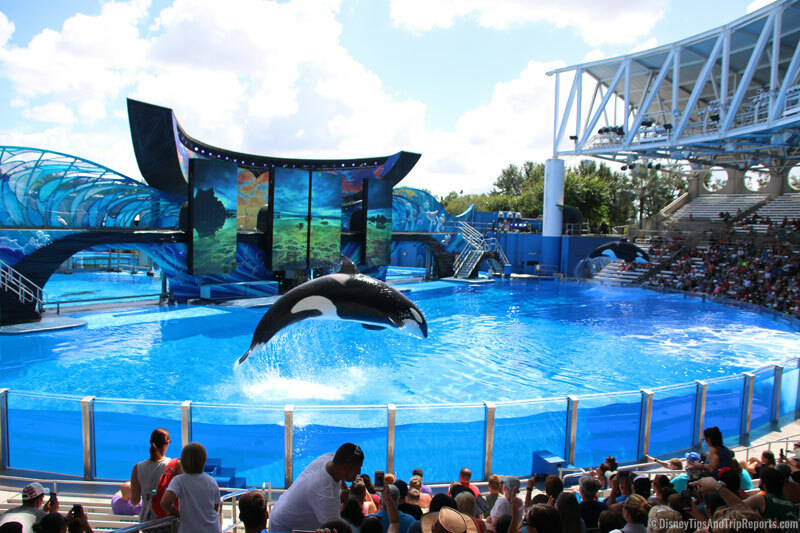 I checked the time for One Ocean, and suggested that we made a beeline for Shamu Stadium as a show would be starting very soon. 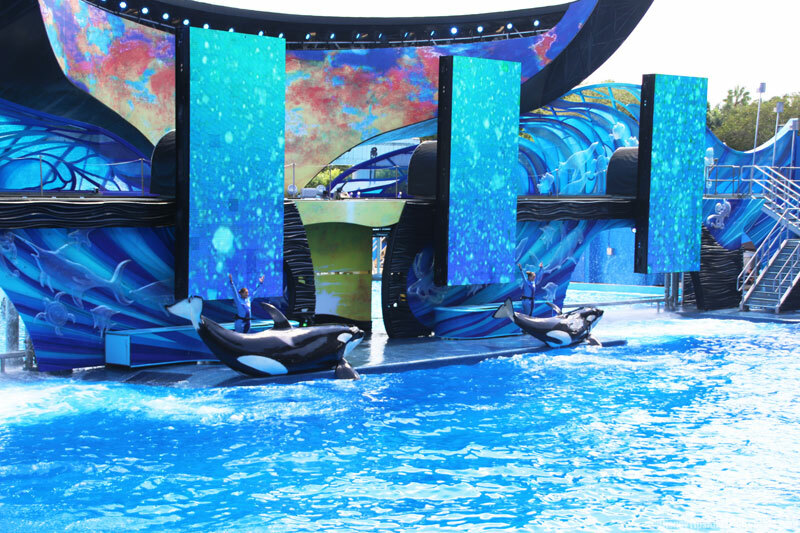 The show seemed mostly unchanged from the last time we visited in 2013, but I’m sure that they added some additional information about the “tricks” that the orcas perform. They said how they mimic things that they would do in the wild. 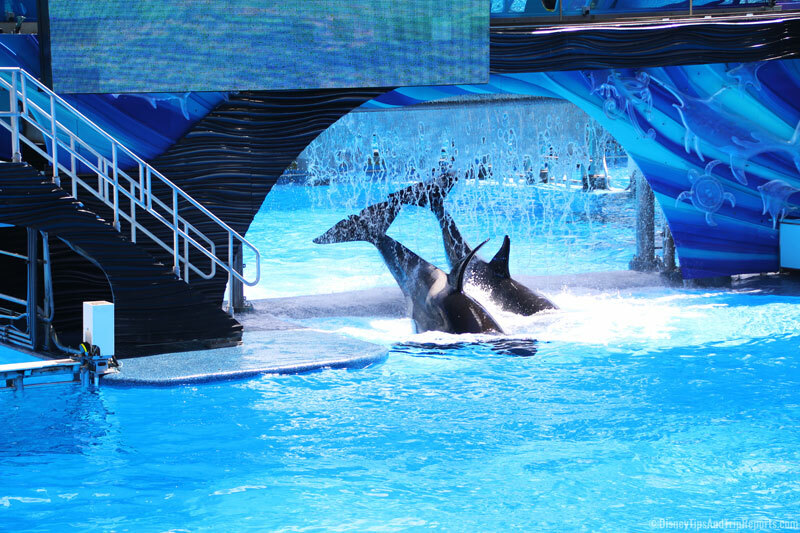 For example when the slide up onto the platforms, it is the same as when the slide onto shore to capture their prey. If the animals didn’t want to do something, they didn’t, and there were several times that they were not co-operative with their trainers! But there were lots of times when they did. 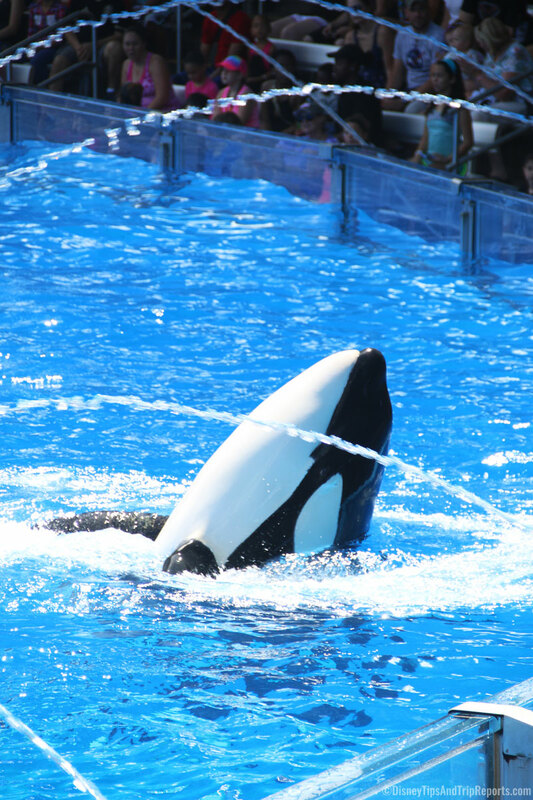 It is amazing how the killer whales can be taught to do the things they do; and it is amazing to watch too. There is a splash zone, so if you want to get soaked, make sure you sit up front! When the show was over, we waited for the crowds to disperse a bit before heading out of the stadium. 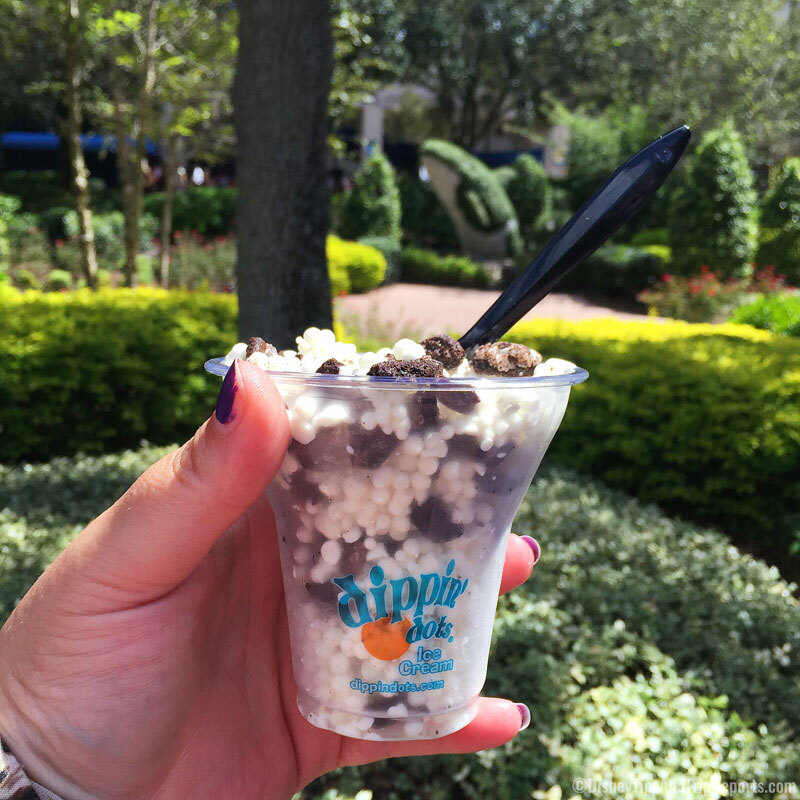 I then declared that we must get a Dippin’ Dots because they are awesome! Each cup is filled with little balls of ice cream, and in some flavours, crushed up cookies. I bought the Cookies & Cream flavour ($7.45), and it was lush! 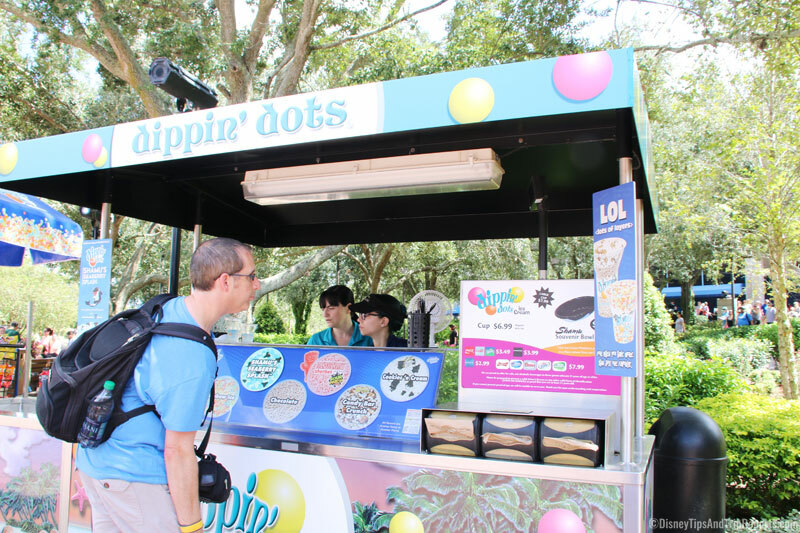 You can’t buy Dippin’ Dots at Disney…but I think you can get them at the Universal Parks. We then ventured to the Underwater Viewing Area and saw some of the killer whales swimming around. We then made our way to the Dolphin Theatre, and the next showing of Blue Horizons.